Students can learn how to determine and manage their impact on the municipal environment by interpreting utility bills, finding customers for recyclable discards and setting targets for themselves in the form of environmental performance indexes. The picture above is an example of what students have learned in their extracurricular activities related to environmental monitoring. Working with solid waste sorting in the school, they discovered the necessity of infrastructure for collection of sorted items and of reverse logistics operators to take them away to appropriate destinations. 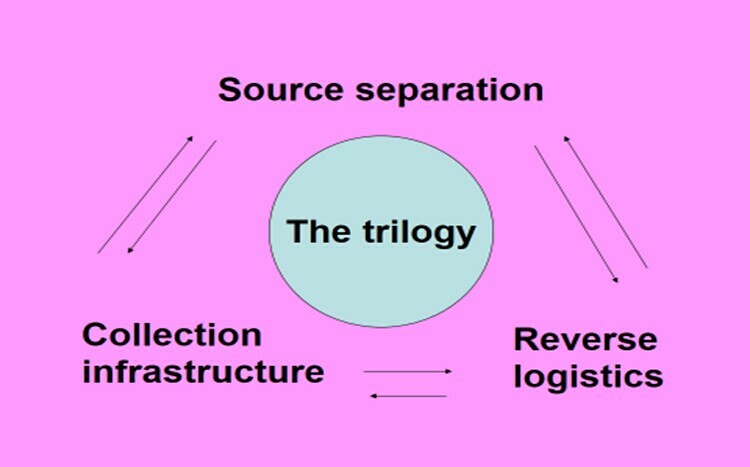 Source separation is but one of the pillars of recycling. This fact was not apparent at the start of the activity. In a recent experiment, M. Fehr’s research team induced primary school students in Central Brazil to develop environmental performance indexes for their schools as means to pursuing a targeted behavior. The indexes included information on waste production and sorting, on noise levels and on water and energy consumption. The results came as a surprise. Students bought the idea of quantifying their behavior through measurements and of setting numerical targets for improvement. M. Fehr set out to challenge the indifference. His team successively worked in six schools in four different cities. With the approval of the respective school administrations, they formed teams of interested students to tackle each part of the environmental impact in the form of extracurricular activities. Students learned how to make organic compost out of food residues from canteens and lunch counters. They produced the compost within the school grounds, proudly showed it as their product and used it as soil conditioner in the yard. There was no more need for the city truck to come by and pick up the food scraps. Students learned how to measure noise with decibel meters, identified the locations with highest noise levels and compared them to legal limits in the school vicinity. They started to supervise themselves and live with less noise. Students measured the amount of inert waste the school produces and determined its composition. With this information, they contacted reverse logistics operators in town in order to find out exactly what can be recycled and under what conditions. It turned out that they found customers for more than 80% of all waste. The city truck had to content with the remaining 20%. Students inspected the water and energy utility bills, divided the total consumption by the number of people in the school and thus discovered their personal impact. Can we reduce it? The teams of students transformed their measurements into dimensionless fractions of ideal values and thus constructed targets to reach through adaptation of behavior. The schools’ environmental performances got under control.